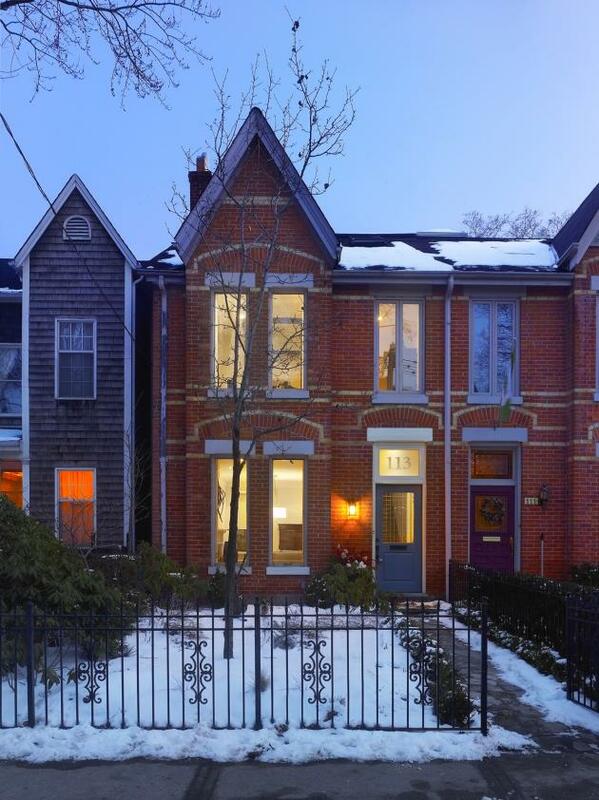 100-year old home, located in Toronto, Canada’s Cabbagetown neighbourhood. 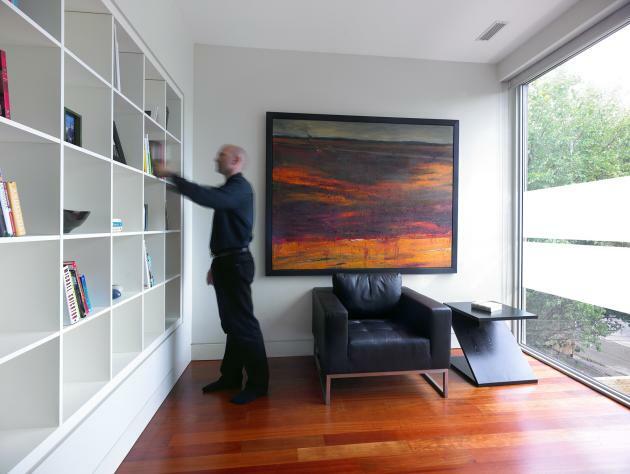 Visit the Dubbeldam Design Architects’ website – here. Full description after the photos….. 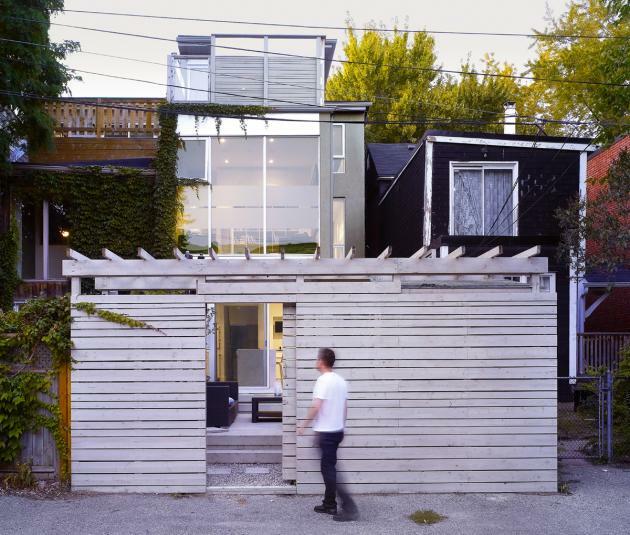 The renovation and addition to this narrow semi-detached house in Toronto’s Cabbagetown neighbourhood updates the 100-year old house for contemporary living while still respecting the house’s historical roots. The owners—a couple with a contemporary attitude and a penchant for entertaining—had a modest budget because they wanted to ensure that they would be able to recover their investment should they need to sell in the short term. The design also acutely responds to the professional needs of the owners: with plenty of natural light to soothe the oncologist and with sensible sustainable features for the environmentalist. At the front of the house, the compact living and dining room are a transitory zone, with crisp white walls and classic modern furnishings, accented by dark hardwood floors and the original crown moldings, fireplace mantle and staircase. Beyond this area the house was gutted and reconfigured with a modern and open design that connects the house both in plan and in section and washes the formerly dark, Victorian interior with natural light and “views” from all angles, allowing an awareness of the changing weather and seasons to permeate into the heart of the house. 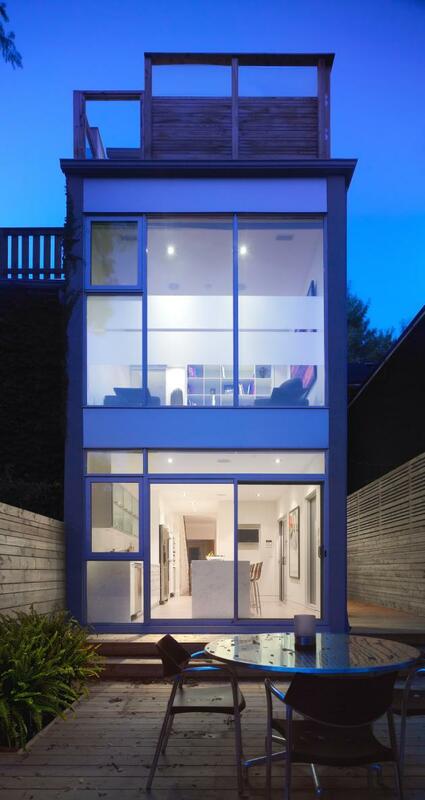 The original semi-detached house was a long and narrow, with small south-facing windows. At the onset of the project, an energy audit was performed and it was determined that the house had significant air leakage, lack of insulation and an inefficient heating and cooling system. Completed in 2008, the renovation to this 2,300 sq. 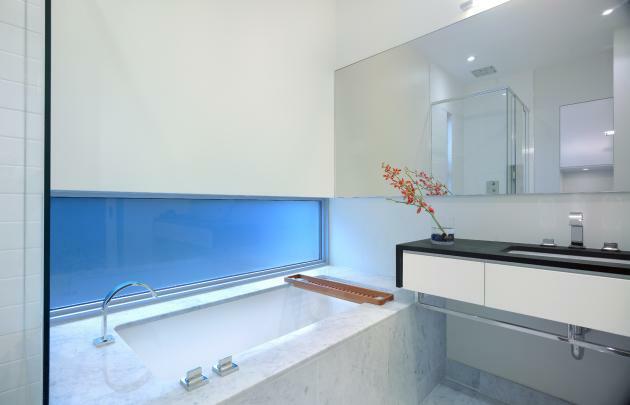 ft. residence was able to address several design & energy efficiency challenges with simple design moves. 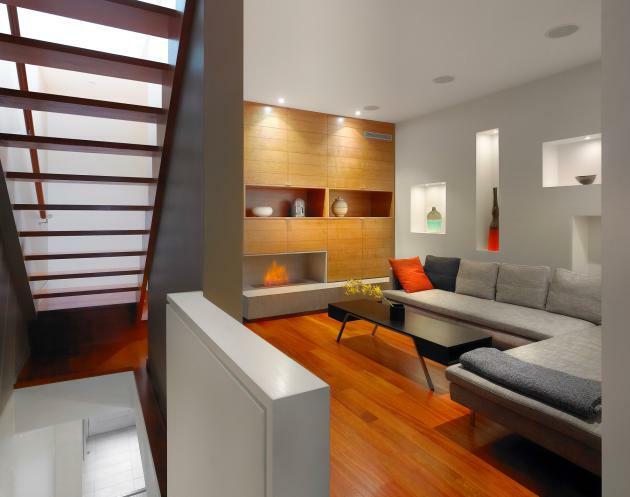 In the new design, partial walls or built-in furniture elements, in lieu of walls, provide a sense of enclosure. Even the staircase between the second and third floors has open-riser treads. 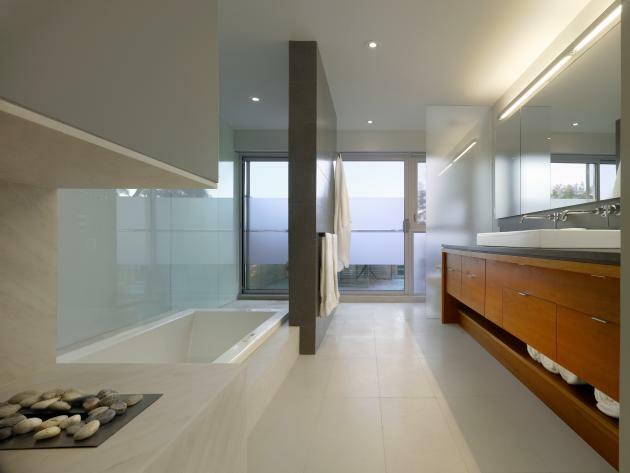 The openness creates the impression of spaciousness and a fluidity that is good for large social functions. It also facilitates the movement of air throughout the house. 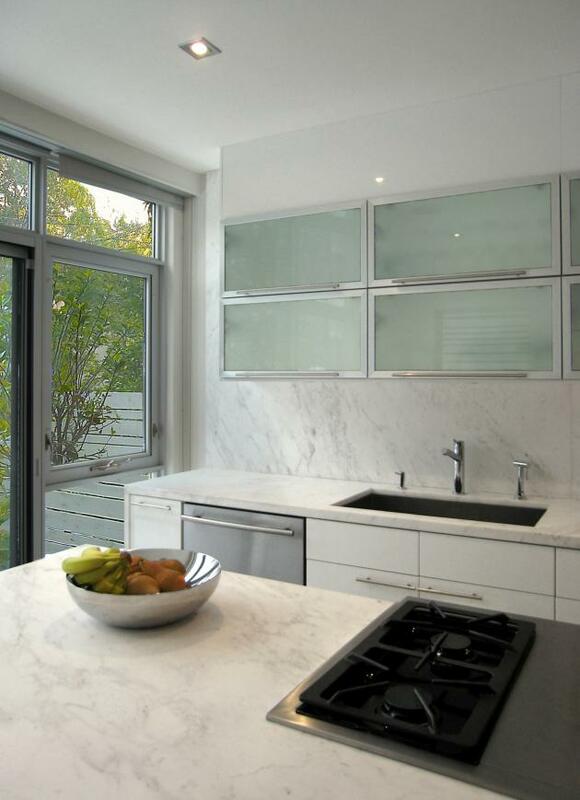 In conjunction with new operable windows, it allows for passive natural ventilation when the windows are open. 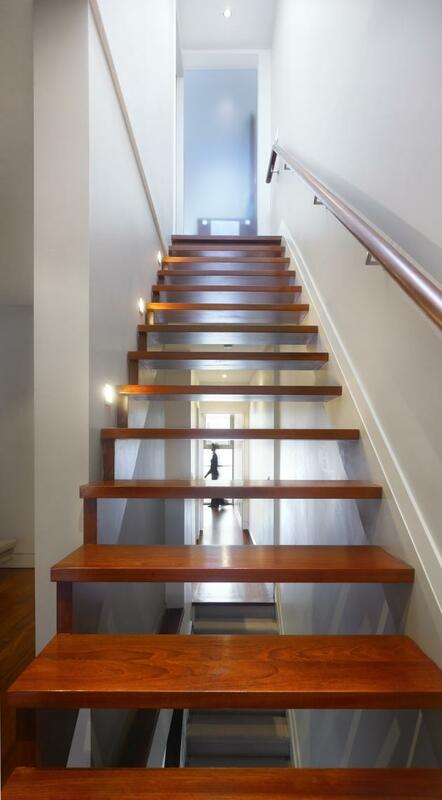 A long operable skylight above the staircase draws natural light down into the heart of the house, significantly reducing the need for artificial lighting, and allows for hot air to escape out of the skylight when open. 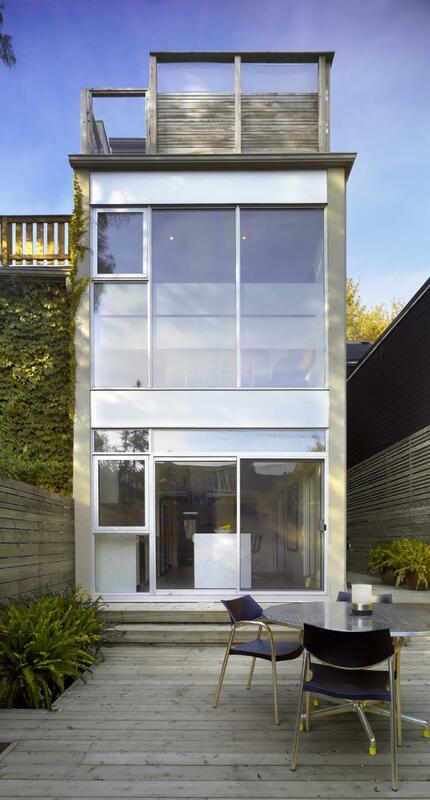 The glazed rear laneway façade takes advantage of a southern orientation, maximizing passive solar gain for heat and light in cold winter months. During the warmer months, deciduous trees and operable blinds help to regulate temperature and allow for visual privacy for the owners. Specifically located operable windows aid natural ventilation and limit energy consumption. Energy systems & fixtures were upgraded to high efficiency models, old windows were replaced with larger low-e double-glazed units, exterior walls were insulated, and renewable wood products were used throughout. 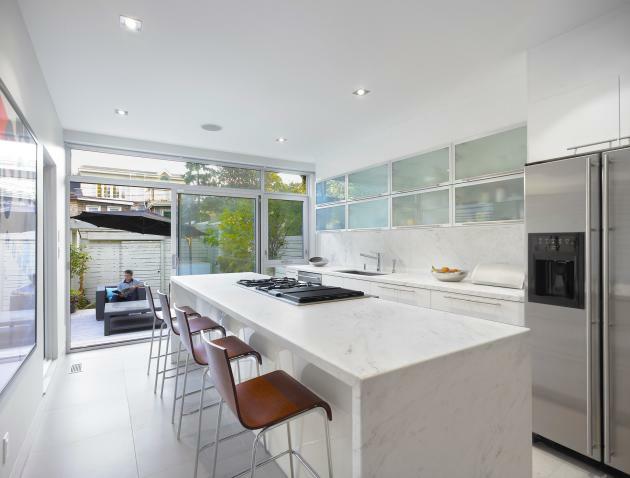 In the kitchen, Ikea cabinets were matched with marble counters, backsplash and a few custom-designed elements so that the kitchen develops a sophisticated and completely customized appearance. 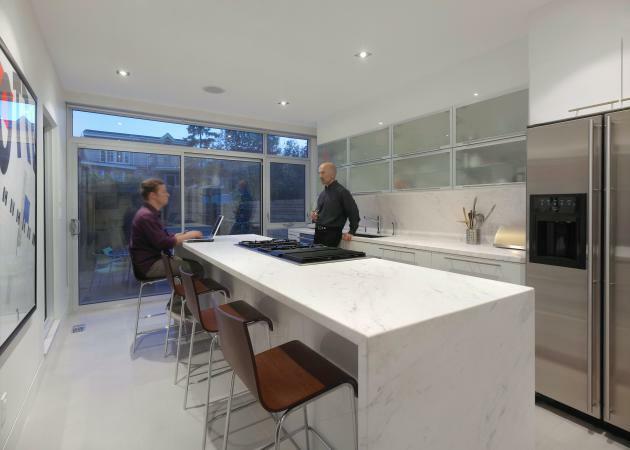 The kitchen was expanded to accommodate more socializing space and a large bar counter that spans the length of the room facilitating the clients’ style for informal gatherings. 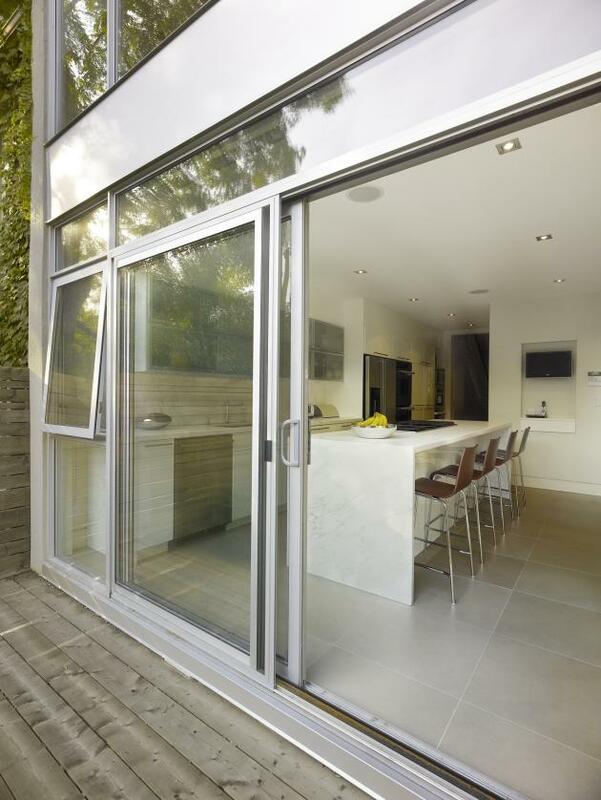 An over-sized glass door slides open to a low-maintenance deck garden, encouraging the owners and their guests to spill outside in the warmer months. On the second floor, a library is bathed in natural light from a full wall of glass. The attic was enlarged and an addition was added to accommodate a master bedroom with an adjoining bathroom, separated by an ethereal fireplace. Like a lofty hotel suite or a retreat away from everyday realities, the third floor terminates with a sheltered roof deck that feels like a tree house perched above the neighborhood. 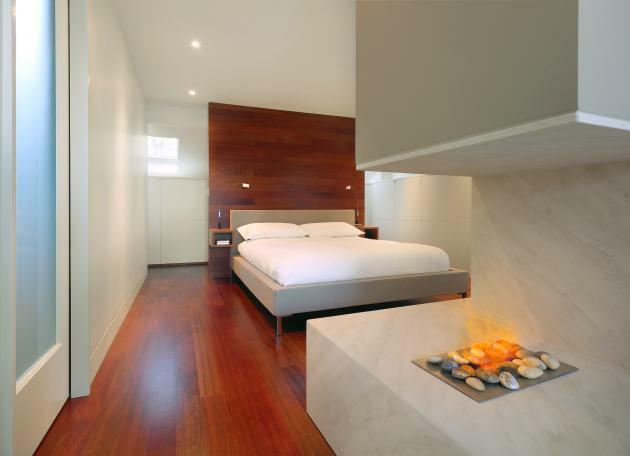 Innovative solutions to optimize storage were worked into the design, including an open walk-in closet in the master bedroom concealed behind the bed wall, providing ample space for the client’s wardrobe and adding to the interior’s pristine, Zen-like feel. Neutral colour palettes were selected throughout to make the narrow space feel lighter and to accentuate artwork and special furniture pieces. 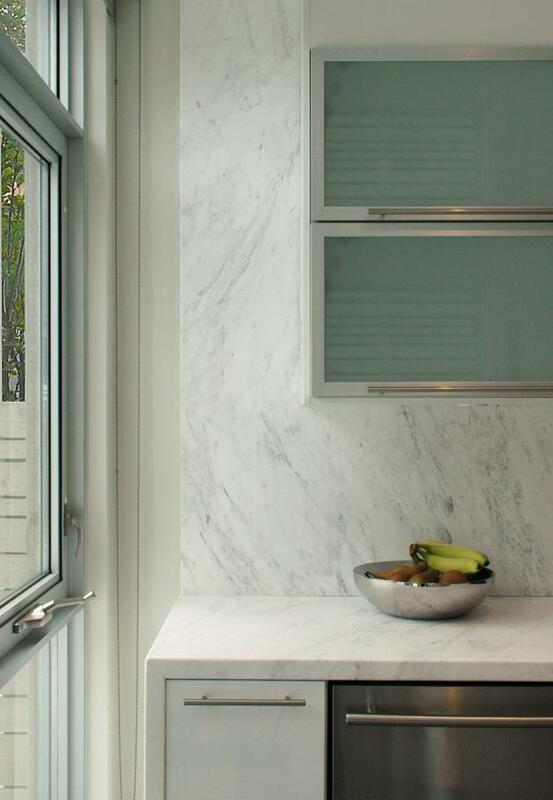 The project was completed on a limited budget thanks largely to the creative adaptation of standard building systems and elements, giving the impression of all custom millwork & finishes (eg. 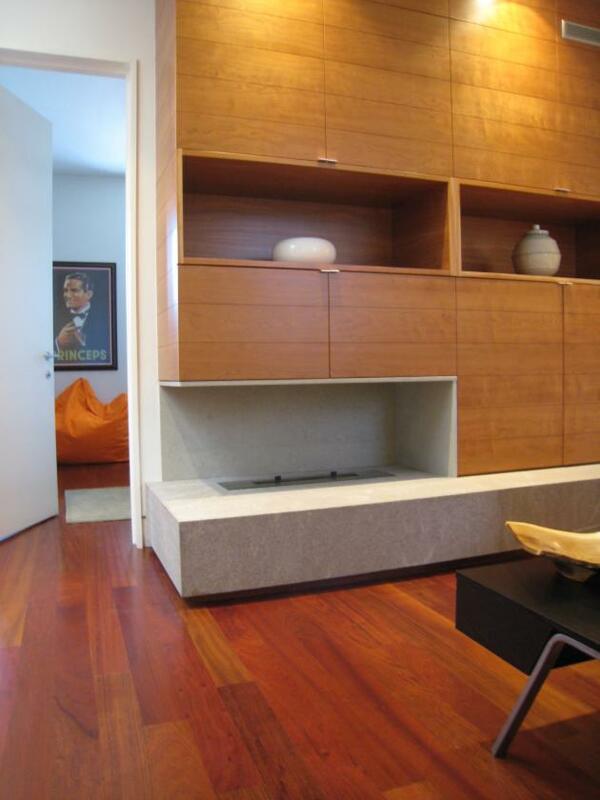 standard Ikea cabinets were incorporated throughout the house but configured to look custom). The thoughtful sourcing and diligent selection of the house’s sustainable materials and finishes resulted in a rich aesthetic at a mid-range cost. 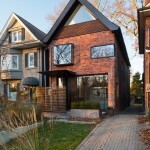 Beyond the initial cost savings in materials and finishes, the owners have already begun to see a return on their investment in lower energy costs, improved comfort levels and a significant jump in the market value of their home that exceeds the original purchase price plus renovation expenditures. That said, the clients loves their new space so much, these savings may have already been spent in wine and food due to their increased entertaining and socializing!